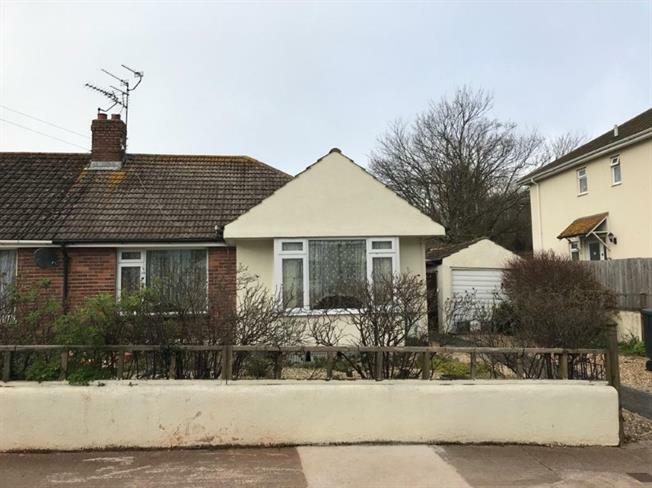 2 Bedroom Semi Detached Bungalow For Sale in Torquay for Asking Price £190,000. In need of updating, a semi detached bungalow having the benefit of a lovely rear garden, driveway parking and a garage. Included in the accommodation is a living room, kitchen, two double bedrooms, bathroom and sun room. Loft hatch, radiator, storage cupboard. Double glazed window overlooking the front garden, feature fire place, radiator. Double glazed bay window overlooking the front garden, radiator. Double glazed window overlooking the rear garden, radiator, storage cupboard. Panelled bath, pedestal wash hand basin, low level flush WC, radiator, part tiled walls, double glazed window. To the front of the property the garden is mainly laid to gravel with borders housing various mature shrubs. To the side there is a drive leading to the garage and front door. To the rear there is a level garden which is mainly laid to lawn with a path leading to a summer house with borders housing mature bushes and shrubs, external store and a wooden fence surrounding.